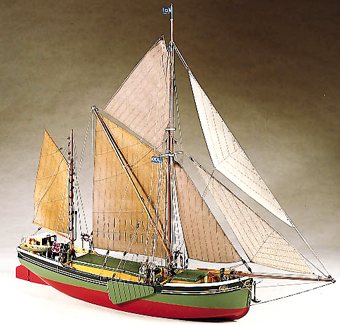 Sailing Barge Will Everard - Billing Models No. 601. I am building my first model boat and have gone for Billing Boats' "Will Everard" Sailing Barge Kit. I have set out the keel and frames on the first half and wonder how to attach the sole plate and hold it in position whilst the glue dries. Any information would be gratefully accepted. I just took a look at the Building Instructions for the Billings Boats Will Everard. If you look closely on Figure 2, you'll see holes where pins used to be. So I can only conclude Billings is thinking that's how to do it. You could also peg it with trunnels (or treenails) using round toothpicks. You ought to mark where the bulkheads are located on each sole plate and drill pilot holes a little smaller than the toothpick diameter. If that sounds scary, try it on some left-over pieces from the kit until you feel comfortable working on the actual model ship bulkhead and sole plate. I'm not entirely familiar with this kit, so I don't know the size and thickness of the bulkheads. If you feel the toothpicks are too course in diameter, you can make them smaller using a jeweler's draw plate. You may find some useful information on the page about Planking HMS Bounty's Jolly Boat (will open in new window).